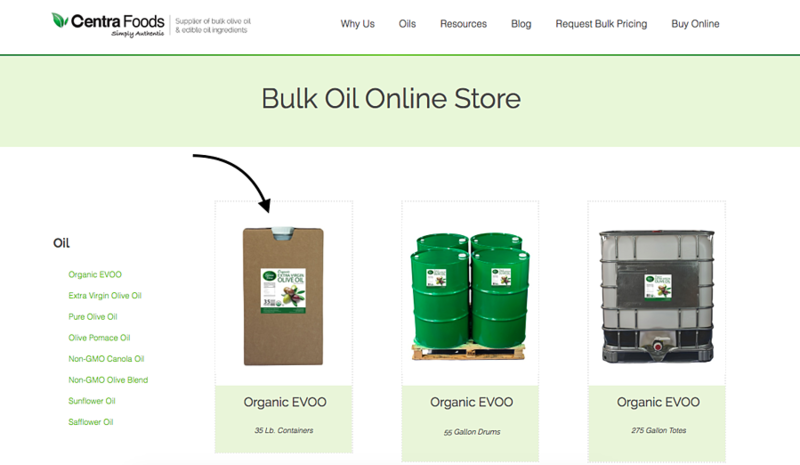 Placing an order at our Bulk Oil Online Store is easy! To finalize your order, follow the below steps. We'll both explain what you need to do and show you exactly what it will look like inside our store. If you'd prefer to watch the instructions in a video, you can watch the below instead. To begin, find the type of oil that you are looking for. 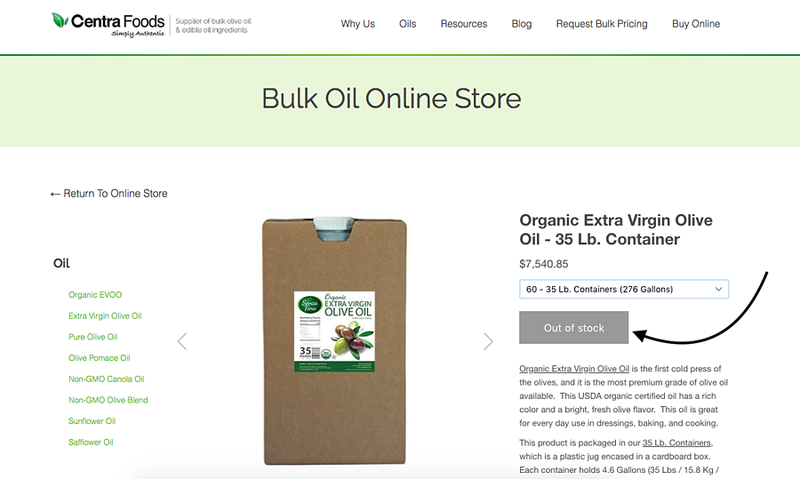 You can either scroll down the main page to look at all oil types and packaging options, or you can select the type of oil you want in the list on the left. 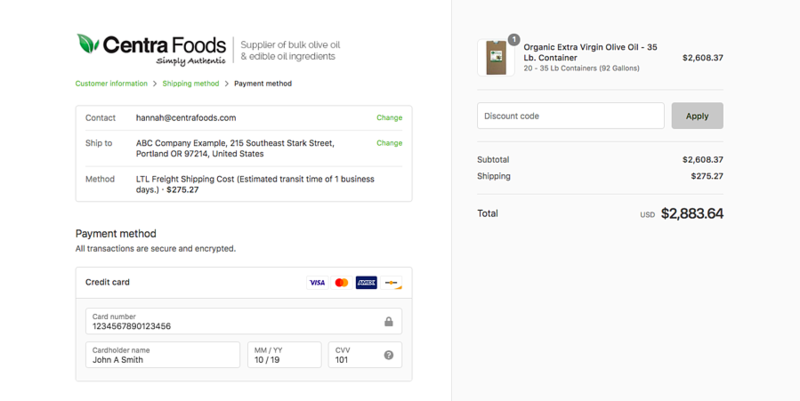 In this example, we've selected the Organic Extra Virgin Olive Oil from the list on the left. After selecting Organic EVOO on the left, any packaging options available for Organic Extra Virgin Olive Oil will be shown. 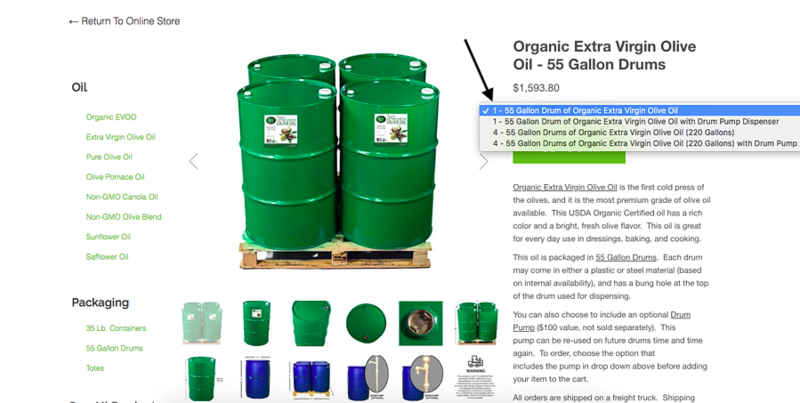 In this example, this product is available in pallets of 35 Lb. Containers, 55 Gallon Drums or as a 275 Gallon Tote. 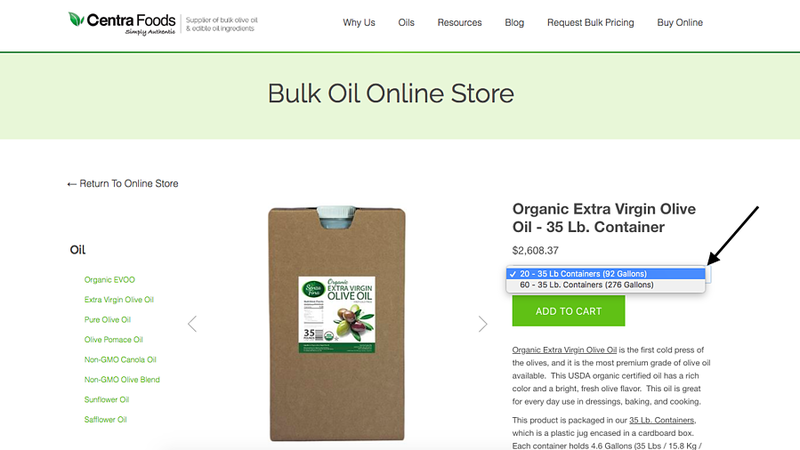 In this example, we wil select the Organic EVOO packed in 35 Lb. Containers. If you scroll down, you can see even more information. Peruse through additional photos, how orders are shipped and more information. Drums and totes are not meant for a typical household or small business setting. These drums are very heavy, weighing over 500 lbs each and requiring a fork lift to move them. Totes are over 2000 lbs. Unless you are set up with a fork lift or pallet jack and an industrial warehouse, we do not recommend this size, as we do not offer returns or cancellations. If you have any debate about which packaging size you can handle, please select the smaller 35 Lb. Containers. They can be carried by hand and are on of the cheapest packaging options available. Before placing any orders, you must read and understand our Return Policy. This eCommerce store does not allow for returns or cancellations, and we have specific requirements for delivery -- most importantly, that you must be on-site to accept delivery. 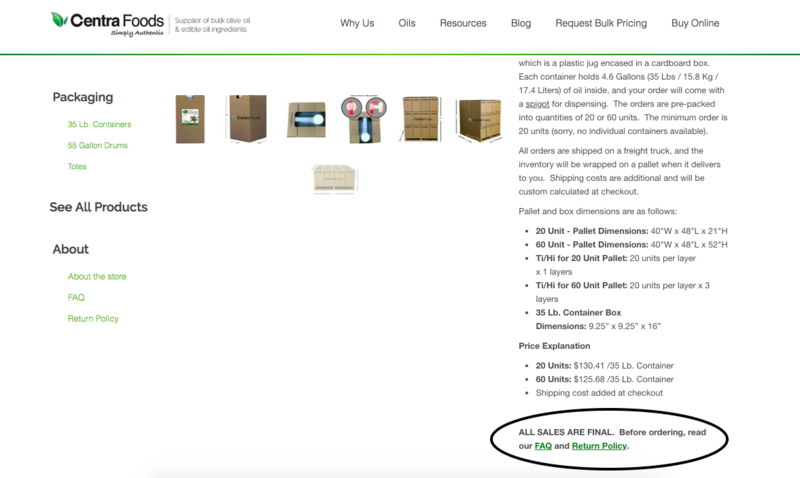 Please make sure that you read this return policy thoroughly before placing any orders. For each packaging size, you can choose your item options. 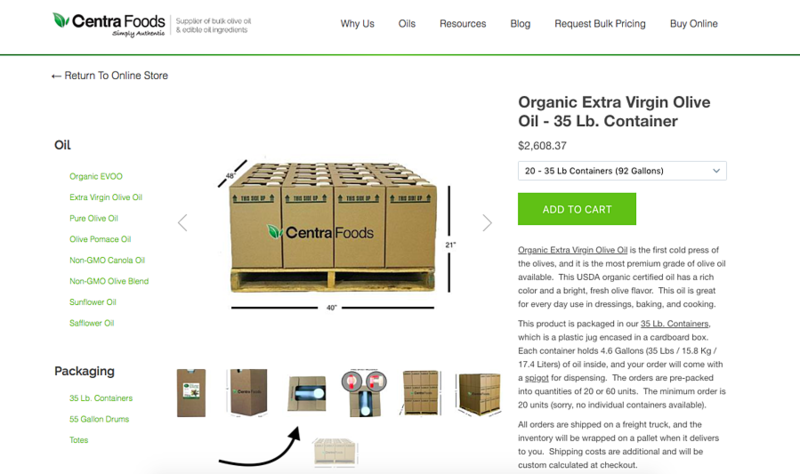 Each item will show a few different variations you can choose from, including the total quantity you can buy (full pallet or partial pallet) and if you will need a dispenser included (if you've ordered the drums or totes). You can select these variations using the dropdown above the Add To Cart button. If you choose an option that is currently out of stock, this is what it will look like. 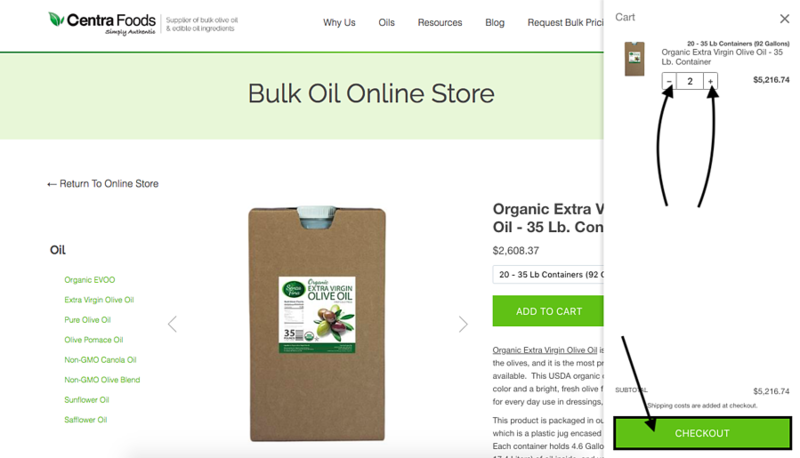 Once you select the item option that you want from the dropdown, add the item to the cart. If you would like to order more than one pallet, hang tight! You can do this on the next step. Once your items have been added to the cart, your cart will pop out on the right side as a separate column. 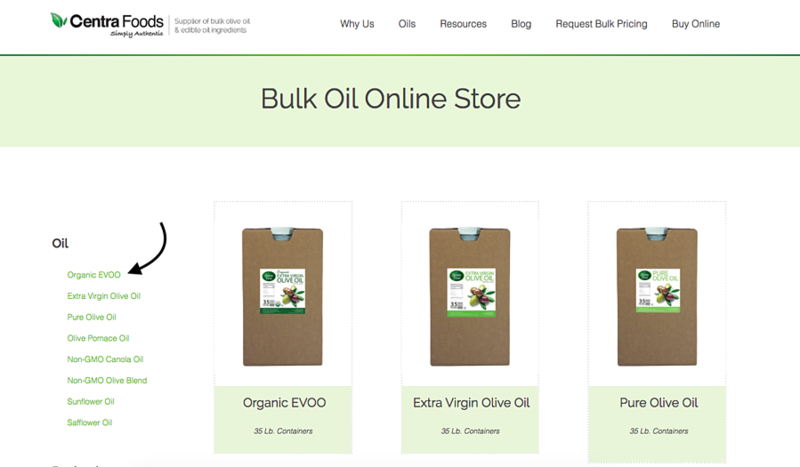 If you'd like to add different oils to your cart, you can continue to shop as normal. 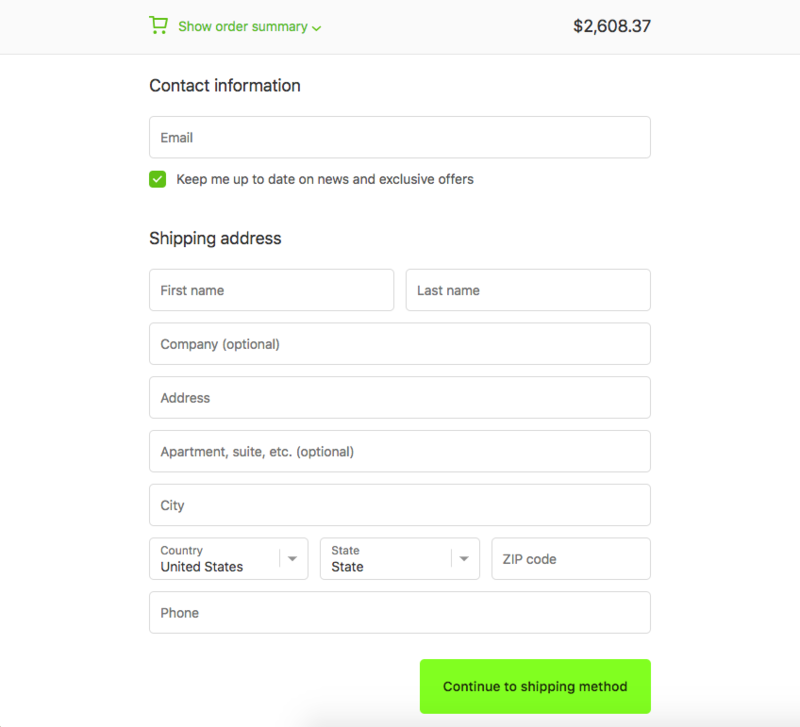 Or, if you'd like to increase the quantity (for example, if you'd like to order 2 totes instead of 1), you can add the total quantity shown in the cart. Once you have all of the items in your cart that you would like to order, you can press the checkout button below. 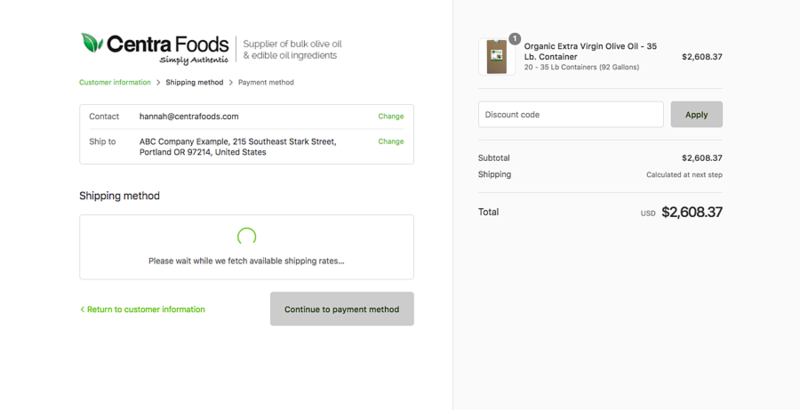 Once you click the checkout button, a pop-up will appear to guide you through the checkout process. You can click on the link "Show order summary" to see a dropdown of your order summary in the window. To begin the process of getting a live shipping quote, enter your address in the Shipping Address area below. Then click Continue to Shipping Method to see your live quote. By entering your address, our store will automatically compile the shipping cost to deliver to your home or business. Give it just a moment to work -- the spinning circle will tell you that it's thinking! Once your shipping totals have been calculated, they will appear on the left hand column along with an estimated transit time. The total cost will be added to you subtotal on the right to give you your final order total. Enter your payment details to finalize your purchase on a credit card. Finalize the last details! 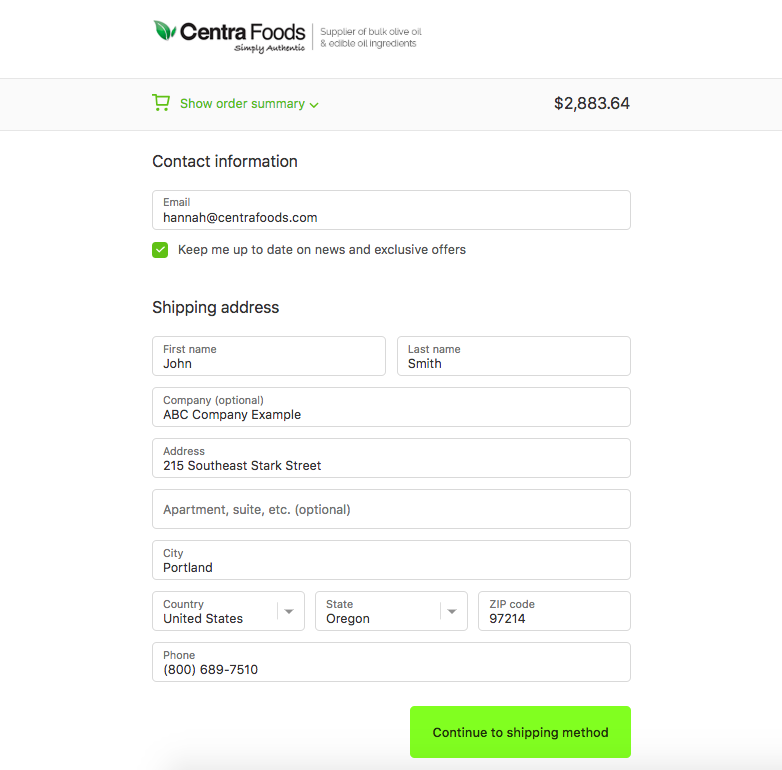 Enter your billing address, and choose if you'd like to save your information on file for your next order to make ordering even easier next time. To finalize your order, click the Complete order button. Once your order has been placed, you will receive an order confirmation email, confirming your payment details and exactly what you ordered. This also confirms that your order has been received and will enter into processing shortly. Your order will be processed and shipped from our facility within 1-3 business days. Once it has left our docks and the tracking information has been confirmed, you will receive an email with tracking details allowing you to get updates on the whereabouts of your bulk shipment as it travels to you. The tracking information will also show an estimated date of arrival for your order. Please note, this date is an estimate and is subject to change. You will receive direct contact from the carrier to set up a delivery appointment window around the date that it is scheduled to arrive. Note: You must be on-site in the agreed-upon window of time for the carrier to deliver and to avoid any additional shipping re-delivery fees.